Welcome to Lent Devotional day 2. You can check out my very brief description of Lent here and the day 1 devotional here. God is righteous and I am not. It is really easy for me to compare myself to others and think I come out pretty good. I mean I haven’t murdered anyone. I either let the guilt of sin fester and keep me from serving God or I pretend there is no guilt. I act like Jesus’ death on the cross for my sins was no big thing. As if He only had to die a “little” for my sins because I’m what people would call a “good person.” Or I can sit at the foot of the cross certain of my guilt and unwilling to accept the forgiveness Christ won for me. The weight of our guilt ought not crush us, nor should we just pretend it doesn’t exist. 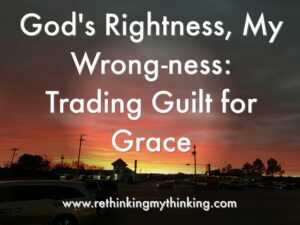 Instead our guilt should bring to mind God’s amazing grace, His sacrifice so we could be in right relationship with Him and live an abundant life. His grace frees us from slavery to sin – even the ones we struggle to overcome or the sins we don’t even realize we commit. Admit they go their own way and fail to acknowledge God as Lord, King, boss of their lives and thus are not flourishing. Further that not acknowledging God as God means they are spiritually dead and in need of a savior. In other words admit they are sinners. Believe that Jesus, fully God and fully man, lived the perfect life they could not live and died the death they deserved to die to pay the penalty for their sin. Then rose again to prove that the payment for the penalty of their sin was accepted by God. Confess that Jesus is the boss, king Lord of their life. This is more than just lip service. This means that all they say, think, do, even their attitudes they place under the authority of Jesus. And they do it all to show their love and gratitude for what He has done and who He is. May we never get over how sinful we are so that we may remain in awe of what God has done for us. Lord, I know I am not perfect and I often mess up. And I know that means my relationship with You is not in good standing. Forgive me for going my own way. I believe that Jesus lived the perfect life I could never live, paid the penalty for my sins which I could never pay, and rose again. From today on I want Jesus to be Lord of my life. Help me to follow Him all my days. In Jesus’ name I pray. Amen. Angela, you are so absolutely correct.